New Delhi, Sep 23 : The eight-member crew of 'Hot as Hell' may get the posthumous honour that they deserve. The US B-24 bomber disappeared in Arunachal Pradesh on a supply run from Kunming, China, to Chabua, Assam, on January 25, 1944, with an eight-member crew on board. 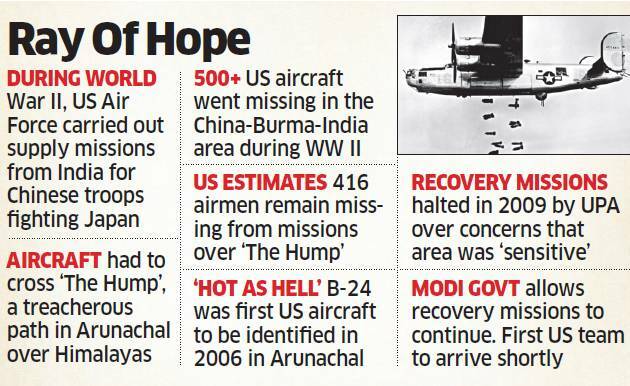 The chances of their remains being recovered have vastly improved with the Modi government allowing the US military to resume search missions in Arunachal Pradesh for the remains of servicemen who died in World War II. That marks a reversal from the position of the United Progressive Alliance regime, which had halted such operations in the northeastern state in 2009 over "concerns" raised by China. Specialised teams from the US, trained to identify and transport the remains of its soldiers who have fallen in combat throughout the world, are expected to visit several identified sites in Arunachal. Many American planes crashed in Arunachal Pradesh during the war while on supply missions into China. An estimated 416 aircrew are missing in India from the war. Most are believed to have gone down in Arunachal as transport planes battled bad weather and the Himalayas — a treacherous route known as 'The Hump' — to cross into China in support of the war against Japan. "Specialised identification and recovery teams from the Defense POW/MIA Accounting Agency (DPAA) will arrive in India shortly to search for Americans that remain unaccounted for from World War II," a US Embassy spokesperson told ET. (POW/MIA stands for prisoner of war/missing in action.) The US has engaged in recovery missions across the world to bring back its war dead but efforts in Arunachal hit a roadblock after the UPA government put a stop to it in 2009, reasoning that the territory was sensitive due to "strategic, internal political, ecological and anthropological reasons". However, recovery missions in other parts of India have continued. The Arunachal Pradesh curb was lifted after a fresh request was made by the US to the Modi government. That's come as a big relief to family members of the war dead who have been pushing for this. "The Embassy of the United States of America and DPAA worked with the government of India to coordinate this opportunity for the agency to work in Arunachal Pradesh, searching for US personnel missing from World War II," the spokesperson said. Officials said the Modi government found the previous administration's reasoning invalid. China claims the territory of Arunachal Pradesh for itself and several of the crash sites are close to the border. Officials familiar with the matter said operations were halted in 2009 largely due to objections raised by China against allowing US military teams into the state. Family members of the WW II missing in Arunachal Pradesh had come together to lobby for lifting the ban. "While this moratorium has been in effect, at least two relatives of the Arunachal missing have died, including a nephew of 'Hot as Hell' co-pilot Sheldon Chambers and a brother of bombardier Robert Eugene Oxford," Gary Zaetz, who leads the grouping, told ET. The B-24's crew included Gary's uncle Irwin Zaetz. The crash site of the aircraft in Arunachal was only discovered in December 2006.